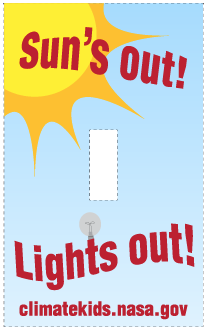 Do you know how much energy you can save if you remember to turn off the light? If you have regular light bulbs, it can save lots of energy. Only 10% of the electricity these bulbs use actually makes the light. The other 90% just generates heat. That's why these light bulbs get really hot when they're left on. That's a lot of wasted energy. Wasted energy is just more electricity that power plants need to make. The less energy we use, the less fossil fuels these power plants need to burn. How can you save this energy? You can turn off the light when you leave the room. How can we remember to turn off the light each time? 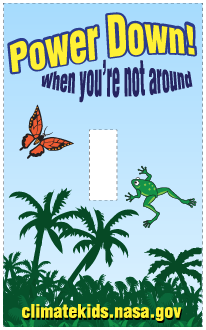 Sometimes people forget... You can decorate the light switch to remind yourself! Print out this template. It's for a regular-sized light switch, single or double. Cut out the guide, and you're ready to go! With double-sided tape, attach the decoration to the light switch. Now you will remember to turn off that light! Learn more about different types of light bulbs and how they can help you save energy.